Lately, I have had interest in monitoring WebLogic’s performance. Since Weblogic is built on Java, there are some standard tools we can use to look into the Java Virutal Machine (JVM). 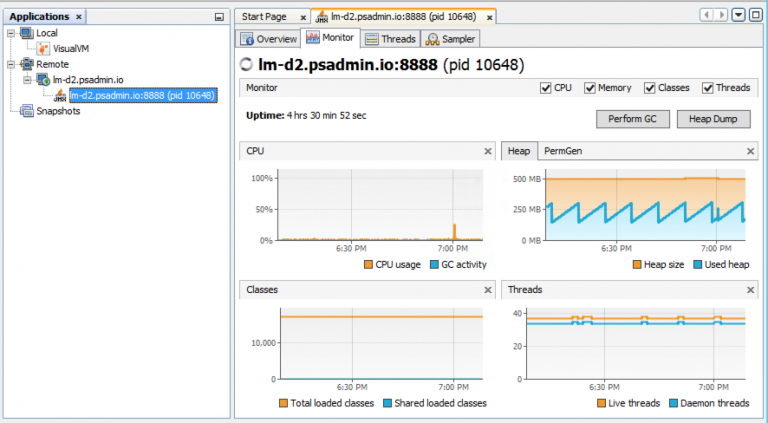 We’ll cover two of those tools in this post: JConsole and VisualVM. Both JConsole and VisualVM are included in the Java Development Kit so they are already on your server. These tools will give you information about the JVM used to run WebLogic and can help you tune you web servers. 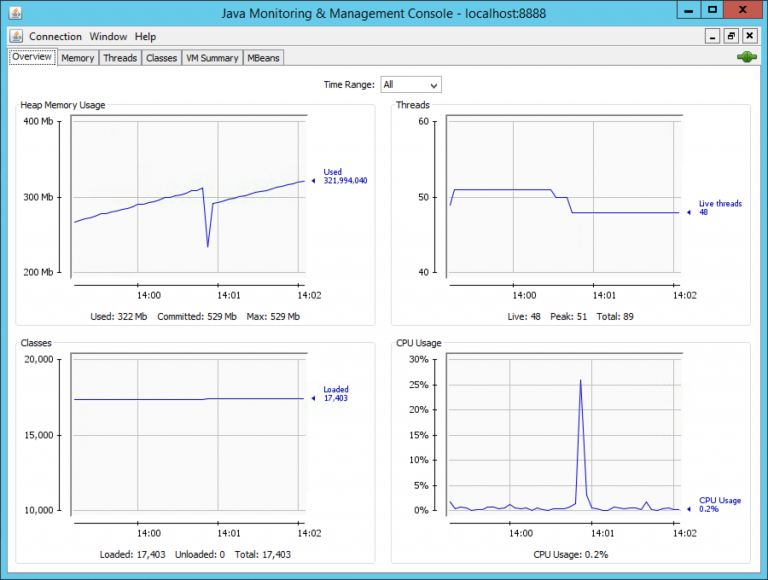 To get monitoring data out of WebLogic’s JVM, we need to enable JMX. 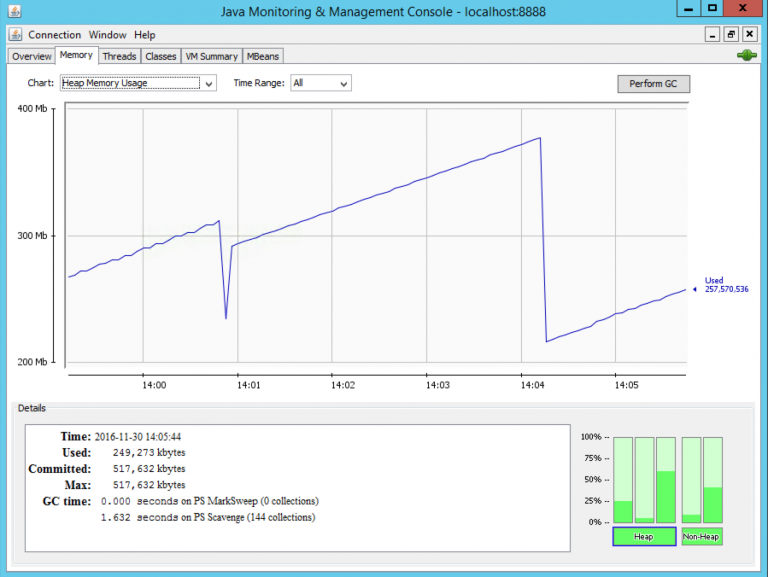 Java Management Extensions (JMX) is a monitoring technology built into Java. Applications that run on Java can build instrumentation into the application to provide performance data about the application. Even without additional data, the JVM will provide CPU, Memory, Thread and other stats about the heap. For testing, I’ve turned off SSL and Authentication, but if you are enabling JMX across all your servers I recommend you turn both options on. For the JMX Port, pick a port value that is unique for each instance of the JVM. Each WebLogic and App Server instance will have its own JVM. For more information on configuring JMX, this is a link to the official documentation. If your are on Windows and updated the setEnv.cmd file, you will want to re-install the Service that starts the PIA domain. The JAVA_OPTIONS parameters are stored in the registry when you create the service. If you update setEnv.cmd, you need to recreate the service (or manually update the registry). Now that JMX is enabled on our domains, let’s look at a few tools to help us monitor our JVMs. JConsole is a utility included with the JDK download. Under JAVA_HOME\bin you’ll find jconsole.exe To start, we’ll run JConsole from our web server where we enabled JXM (instead of our desktop). 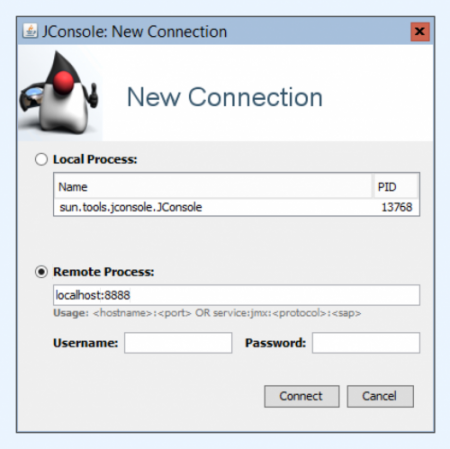 Open JConsole and it will ask you to connect to a JMX Process. You have two options: Local Process and Remote Process. We’ll use the remote process option and use these values to connect to our web server: localhost:8888. We don’t need a username or password since we passed the flag jmxremote.authentication=false. After connecting, you’ll get a message asking about your insecure connection. Click “Insecure” to continue. On the main page, we see 4 graphs related to the JVM. These graphs give you a good overview of the JVM status. The CPU graph will show you how much of the CPU that JVM is using, and the Threads graph gives a good indication of workload on the JVM. The best part of JMX is the Memory graph. Getting your JVM Heap sized correctly can make a big different in performance. The graph should follow a pattern when Garbage Collection runs. VisualVM is another untility included with the JDK download and is also under JAVA_HOME\bin. 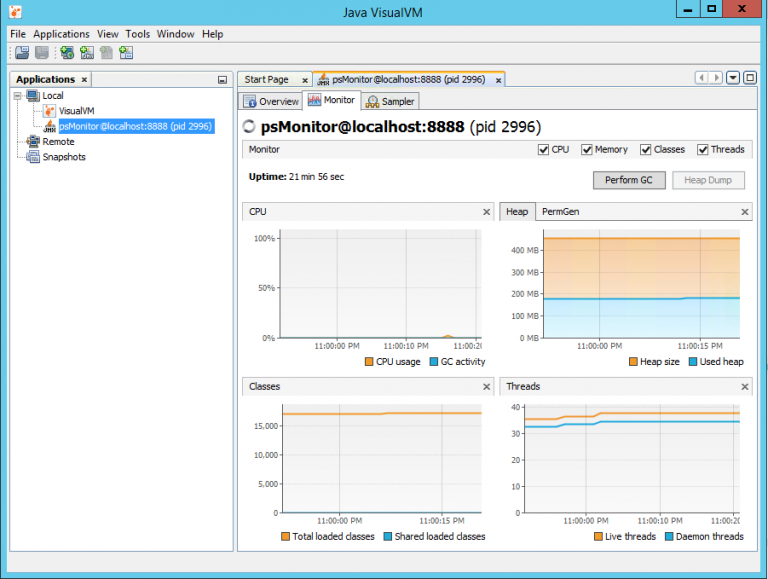 We’ll start VisualVM on the server as well by running jvisualvm.exe --console new. 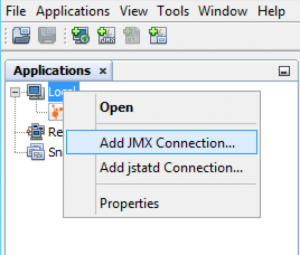 When VisualVM opens, we create a new connection by right-clicking on “Local” and selecting “Add JMX Connection”. Fill in the port number and select “Do not require SSL connection”. VisualVM show us similar data as JConsole, but I think it looks a nicer. Under the Monitor tab, you can also force the JVM to run a Garbage Collection. For the most part, these two applications are similar. After you add that parameter to your setEnv.cmd JAVA_OPTIONS line, restart the web server. On a different computer or server, launch VisualVM or JConsole. Create a remote connection to JMX on the server. 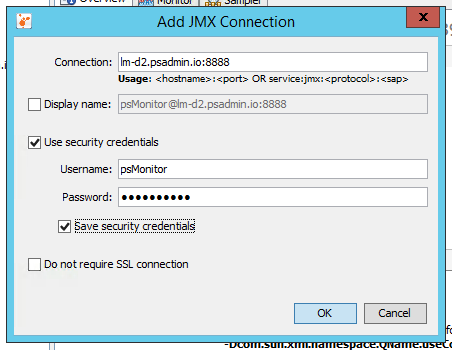 In the Connection box, enter the server name and port for the JMX instance. 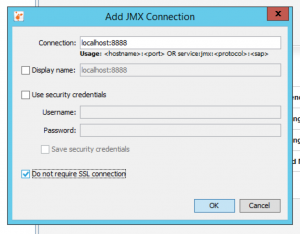 Once you get the basic configuration in place, you want to enable authentication to connect to the JMX instance. The default JMX authentication is stored in the JDK folder. That will affect all domains using the JDK folder. Instead, we will use a JMX password file for each web server domain. Add the line psMonitor readonly to the bottom of the file and save. 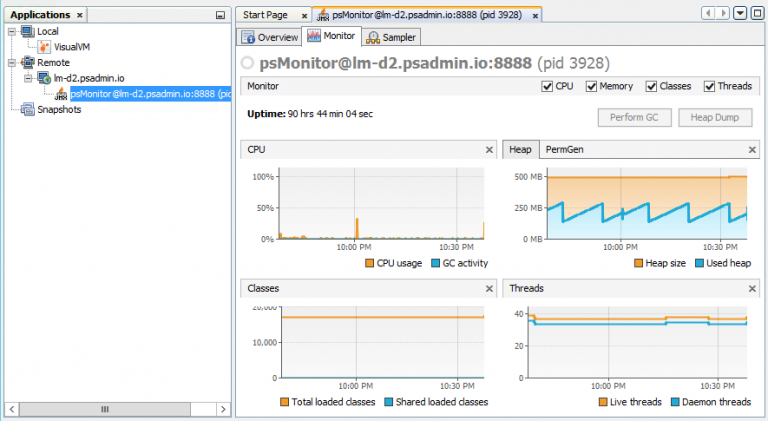 This line adds a new user named psMonitor and a read-only account to any JMX instances using this JAVA_HOME. Copy the file JAVA_HOME\jre\lib\management\jmxremote.password.template to PS_CFG_HOME\webserv\jmxremote.password. Open the new jmxremote.password file. Add the line psMonitor test123 to the bottom of the file and save. This line sets the password for the psMonitor user. To give each web server domain a different password, set a unique password in this file under each PS_CFG_HOME. Restart the web server for the new paramters to take affect. Now that we have a web server configured to run JMX with authentication, we will create another connection in VusualVM to use the username and password. Enter the server name and port. Enter psMonitor for the Username and test123 for the Password. I grab the stats myself and throw them in a database. Also starting to move the output to SPLUNK for ease of graphing trends & alerts. Just setup a shell script to open a WSLT connection, (I still use weblogic.Admin). Then call python similar to below. Thanks Frank! I like the WLST approach to grabbing WebLogic stats.What kind of database are storing the stats in? Oracle right now, created an extra table in our PerfMon to hold WebStats (also have modded jsmon.sh to throw appserver stats to a table). Starting to aggregate everything in splunk and both have timestamps, so will probably move that direction.